I like candles and love how the scent can fill a room and change the atmosphere but I wouldn't call myself candle obsessed, not yet anyway. This is why I have only just bought my first Diptyque candle after years of seeing them on blogs and instagram. I just couldn't get my head around the idea of spending £40 on a candle. I would happily pay £40 for a perfume or a skin care product but for some reason that figure stops me from wanting to spend it on a candle. June came around last year and I was asked what I wanted for my Birthday by family. Unsure of what I really wanted I asked for a Space NK voucher and because it technically wasn't my money, I decided to try one of the candles along with a couple of other things I didn't really want to spend my own money on. I already owned Diptyque Philosykos perfume so I knew pretty much how this was going to smell and that I would like it. I love fig scented products, I have various perfumes and bath and body products with the scent, and the Diptyque offerings are some of my favourites. 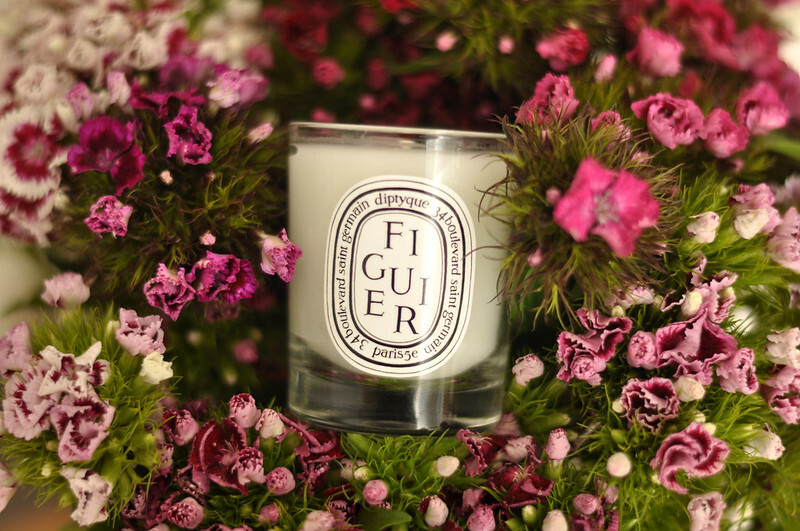 To me, Figuier is more of a spring and summer scent and I still find it a bit odd to light a candle during these seasons even though I do, it doesn't have the musky deep notes I prefer in the winter. "The warmth of fig wood, the freshness of fig leaves and light milky sap all blend to create a scented candle that is a glorious ode to the fig tree." There is a hint of darkness in the background of the scent but when burning the candle it is the fig that is the dominant scent. Even when it's unlit, I can smell it when I walk into my room and once it's lit the scent flows into the rest of the house. It isn't headache inducing strong though like some other candles I've tried have been. As this is such an expensive candle I wanted it to burn cleanly and properly so I kept it lit for a couple of hours the first time. Each time I lit it after that I made sure the wick wasn't too long and so far so good, it's pretty much clean where it's burned away. Now don't get me started on the pretty much perfect packaging. I cannot wait to finish the candle, although I am dragging it on and only lighting it occasionally, so I can re-use the jar and have it sitting on my dressing table looking pretty. This is definitely not the reason I bought it but it is a nice bonus! This scent sounds incredible, and as always their presentation is flawless!